Niall says, steer clear of this! 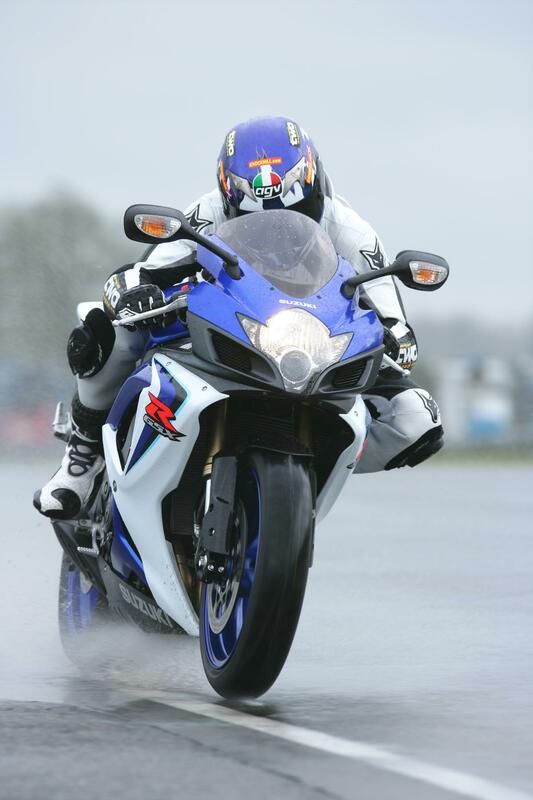 Riding in the wet isn't most people's idea of fun, but if you've booked a track day don't let rain stop play. If you can be smooth and confident in the wet you'll only be a better rider in the dry, so don't waste the opportunity to learn. The key is to relax, not panic, and get out there and have fun. Niall knows best: "As with all riding being fluid - pardon the pun - at all times is the key. Smooth application of the brakes is crucial, but you'll also find that backshifting earlier using the engine to slow you down is effective. Once you're off the brakes, get the weight balanced before you turn in as side grip is minimal in the wet. 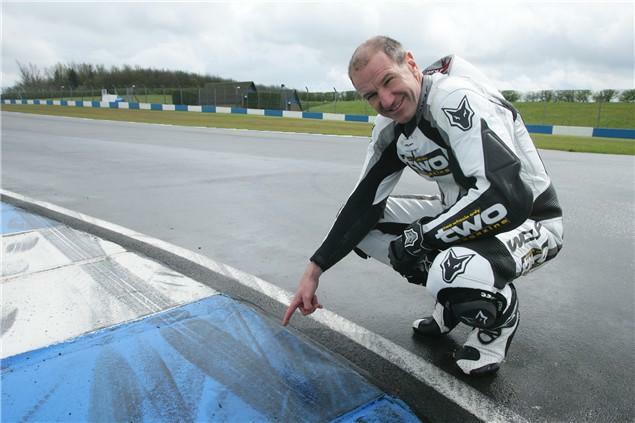 "Use a constant throttle mid-corner then, when you're accelerating out, very gradually open the throttle until you're upright and on the grippiest part of the tyre. If possible drive out in a higher gear as this will make the power softer. Feel for wheelspin as you go, and be ready to roll back the throttle if the tyre loses traction." Staying comfortable, seeing where you're going and keeping in control is important too - if you get cold and miserable your concentration will suffer. Niall again: "Wear thin rubber gloves under your leather ones - they'll give you better feel. Fog City or Pinlock visor inserts guarantee you clear vision and no fogging, but make sure your visor is adjusted properly as water can come down the inside at high speed. Taping along the top will eliminate this. Finally, wear Tesco carrier bags inside your boots -they are absolutely brill at keeping you tootsies dry!" 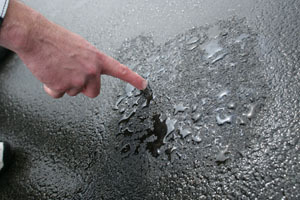 "Overbanding or Tarmac joins can be like ice in the wet. Treat with extreme caution, running over them slowly in the early laps to find out how slippy it really is." "The paint used on kerbs differs from track to track, with the more modern circuits having more abrasive paint. But the best plan is to stay well clear of anything that isn't black asphalt." "You need to be dead upright crossing oil. It isn't always easy to see so look out for the red and yellow flag and wear a clear visor - unless you're Rossi, who won last year's wet British GP wearing the blackest visor!" "Tyre warmers make little difference as tyre temperature drops as soon as you hit wet Tarmac, so build speed up over four laps. Be extra careful with new tyres - it's worth scuffing them up before riding. Don't lower tyre pressures either - all this does is close the grooves that disperse the water. "As with the painted kerbs, white line paint marking the edge of the track differs from circuit to circuit. Going this close to the edge means you're nearly on the grass, so stay well clear." Niall knows best: "As with all riding being fluid - pardon the pun - at all times is the key. Smooth application of the brakes is crucial, but you'll also find that backshifting earlier using the engine to slow you down is effective. Once you're off the brakes, get the weight balanced before you turn in as side grip is minimal in the wet. Staying comfortable, seeing where you're going and keeping in control is important too - if you get cold and miserable your concentration will suffer. Niall again: "Wear thin rubber gloves under your leather ones - they'll give you better feel. Fog City or Pinlock visor inserts guarantee you clear vision and no fogging, but make sure your visor is adjusted properly as water can come down the inside at high speed. Taping along the top will eliminate this. Finally, wear Tesco carrier bags inside your boots -they are absolutely brill at keeping you tootsies dry!" Click here for Niall's Top Wet Track Motorcycle Riding Tips.